Although they are still to win in the tournament, Việt Nam can progress if they beat Yemen, and other matches elsewhere in the competition go there way. The top four third placed teams will move on to the next stage, but coach Park knows to “do so, they must relay on other teams winning or losing. “The loss has made Việt Nam to fall to third of Group D, with zero points and stand at the bottom of the group,” he said. “However, we still have our chance to play with Yemen in the last match. On Saturday night, Việt Nam were not out-played but more a case of out-muscled. Iran, managed by former Manchester United number two Carlos Queiroz, were far more physical from the outset, leaving the Golden Dragons struggling to get a foothold on the game. In training earlier this week, Park had worked endlessly on dead-ball situations, but both Iran goals came from open play. Their first came on 38 minutes. After good work down the right hand side, a cross was pinged into the box and with the Việt Nam defence seemingly asleep, Sardar Azmoun was unmarked just a few yards out and free to head home. After the break, Azmoun doubled the lead on 70 minutes. The ball was fed through to him on the edge of the box, and after neat foot-work he struck a left-foot shot into the bottom corner. Việt Nam goalkeeper Đặng Văn Lâm will be disappointed he never made more of an effort to prevent the goal when he watches the replay. Before the opening goal, Việt Nam did have chances to break the deadlock. As early as five minutes, defender Đoàn Văn Hậu burst down the right wing but Nguyễn Trọng Hoàng was unable to finish from his cross into the box. A few minutes shy of the half hour mark and Hậu found himself in a good position inside the Iran box but his shot went wide. After Iran went two goals up, Việt Nam went on the attack, knowing that extra goal could make all the difference when it comes to the latter stages of the competition. As the clocked ticked towards the 90 minutes mark, Nguyễn Quang Hải had the opportunity to test the Iran keeper with a free-kick from the edge of the box. But his effort was disappointing, straight into the arms of the opposition number one. 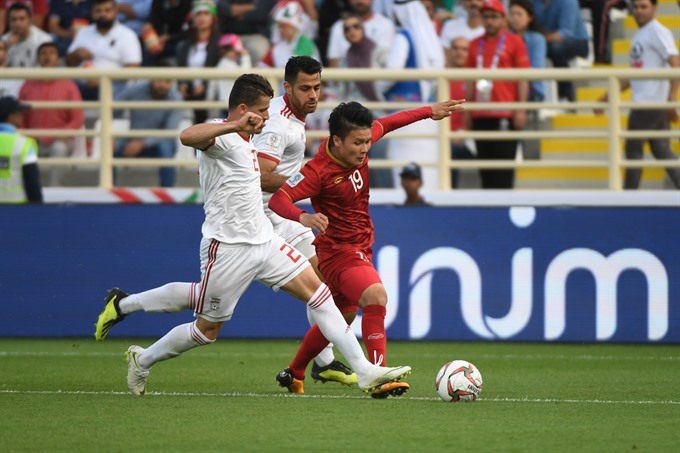 With just two minutes left on the clock, Hải found himself in a good position a few yards from goal, but with a strong Iranian defence in front of him, Hai could only steer his effort wide of the post. After the match captain Quế Ngoc Hải said: “Iran are a strong team. They are number one in Asia. “They showed their level in this match despite us doing our best. We are proud of our performance and our spirit. Iran currently top Group D with six points after two games. Iraq are second with three points followed by Việt Nam and Yemen are yet to add to their points tallies. Việt Nam will play Yemen on Wednesday evening at 11pm Hà Nội time.